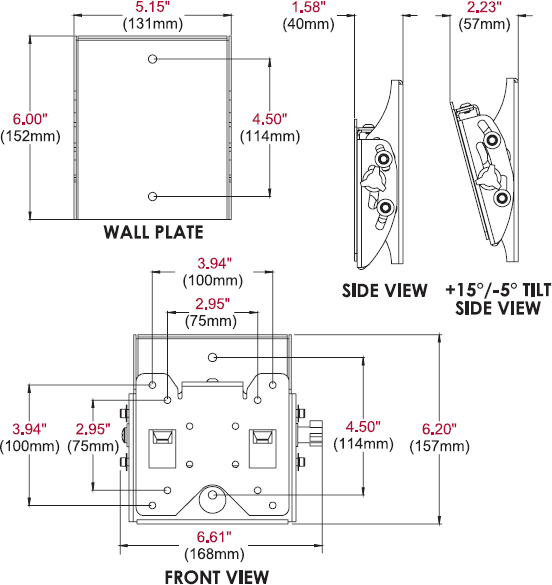 Peerless ST630 SmartMount Tilt Wall Mount series offers the most versatile installation features and mounting options. Quickly and easily adjust the viewing angle without the use of tools. Security screws provided in the ST630 model deter tampering and theft. The display can now simply be installed by a single person with the Hook-and-Hang system. The Easy- Glide adaptors hook onto the wall plate for an overall quick, simple, and secure installation. Helpful Hints: The ST630’s adjustable viewing feature provides 15° of forward tilt and 5° backward tilt, creating the most optimal viewing angle.